A great pie starts with flaky buttery pie crust. And there are million and one perfect pie crust recipes out there. Hand-written, stained recipe cards passed down through generations, some made with all shortening, some with combination of butter and shortening, some with lard, or even all butter, with vodka and without, variations are endless. 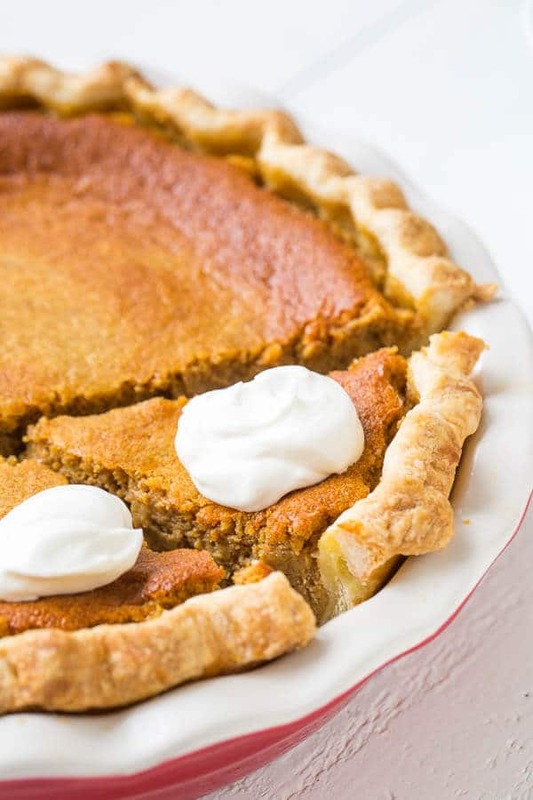 And here I am contributing my version into the mix along with my tips on how to store/freeze pie dough for extended period and avoid annoying shrinkage issues during baking. So what makes this recipe special? This pie dough is made of all butter. It’s convenient for those of us who don’t usually have shortening on hand. Just for the record, I have nothing against shortening or lard, it’s just I don’t use them enough to keep them on hand. Egg yolk adds a little bit more flavor and richness. 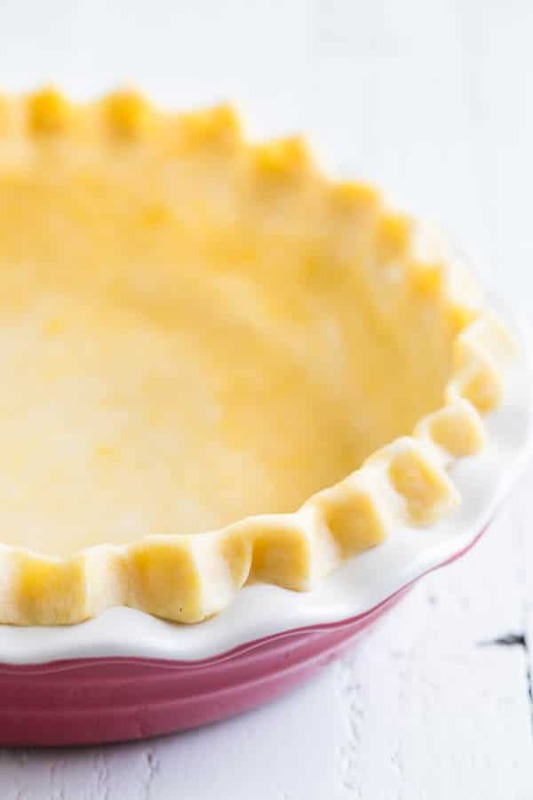 You’ll get flaky, tender and the most flavorful pie crust every SINGLE time. I’ve made it enough to know how reliable and foolproof this recipe is. And my family loves this crust! But why people bother with old-fashioned butter/shortening pie dough then? Well, I’m glad you asked. Pie dough with shortening holds its shape better especially if you took your time to shape a beautiful pie edges. And thus, if the appearance is important to you, go with shortening. That being said, you’ll still get decent – aka rustic – looking pies with this pie dough, but extra tender and melt-in-your-mouth flaky! 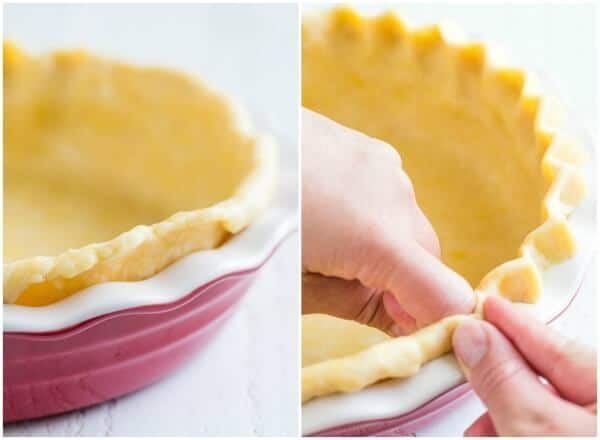 Let me show you how I crimp the edges of my pie crusts. I don’t cut out excess dough (just make sure not roll out too big circle), as you may have seen in a lot of recipes. It seems wasteful. So instead, I fold the edges out and roll it until it meets the pie dish. You’ll get nice and thick border, if you will. It won’t be perfect all around, in some places it’ll be thinner, and in some places thicker, but that’s ok. Now you can crimp the edges however your heart desires. I use simple 3 finger method, as shown below. Classic and timeless. Now, as promised, let’s talk about the shrinking issue. It’s certainly the most annoying pie problem of all. #1 key to avoid the shrinking problem is to rest and chill the pie dough before baking. Once you crimp the edges of the pie, put it in the fridge to chill while you prepare the filling, for at least 30 minutes. The longer it chills, the better. You see this pumpkin mousse pie? This is the baked version of the above crust. Not much shrinkage, right? And as I mentioned earlier, due to high water content in butter, all-butter pie crust doesn’t hold its shape as good. But I don’t complain, the flavor and texture makes up for it. Extra pie dough is never a bad thing. In fact, it’s an absolute must for me, because I love me some pie!! 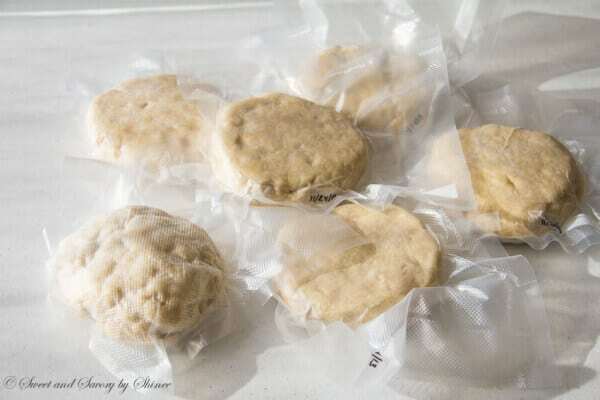 Especially right before holiday season hits, I stock up on whole bunch of them and freeze them in vacuum sealed bags. That way they store better and longer. But if you’re going to use them within a month or two, just wrap them in a plastic wrap and then place them in a freezer bags. 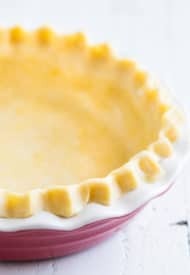 Foolproof all-butter pie crust recipe with tips and tricks on how to store/freeze, blind bake and how to avoid annoying shrinking issues. To make the dough, in a large mixing bowl with paddle attachment, mix together flour and salt. Alternatively, you can use a pastry cutter, instead of stand mixer. Add frozen butter cubes and mix until butter is somewhat mixed into the flour with visible chunks still there, while mixer is running on low. Add egg yolk and continue to mix until the butter pieces are about pea sized. Stir in ice water one tablespoon at a time, until the dough is almost comes together. Depending on humidity, you might not need all the water, or you might need additional couple of tablespoons. That’s why you need to add it 1 tablespoon at a time until big clumps of dough sticks together. 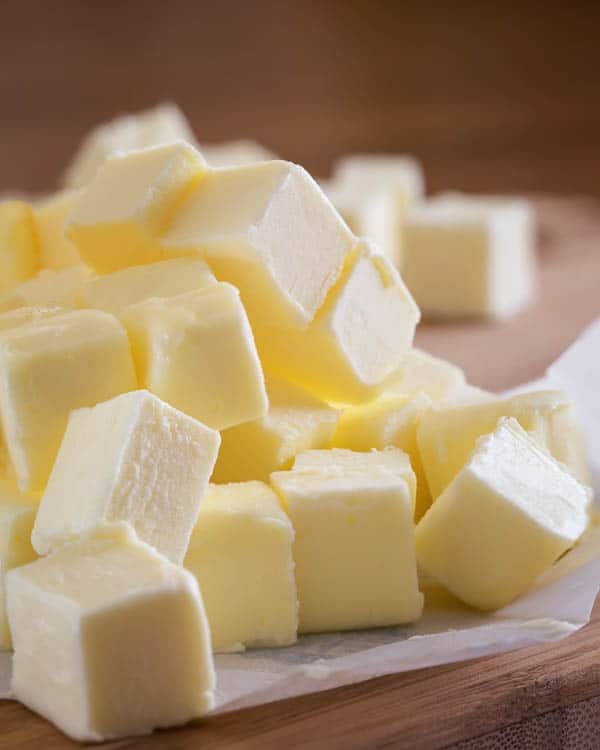 Don’t be alarmed if you see pieces of butter in the dough, that’s exactly what you want to see. Those butter pieces will melt during baking and create the most tender and flaky crust. Form the dough into a ball and slightly flatten into a disk. Wrap it in a plastic wrap and refrigerate for at least 1 hour, or up to 3 days. Or place it in a freezer bag and freeze for up to 3 months. 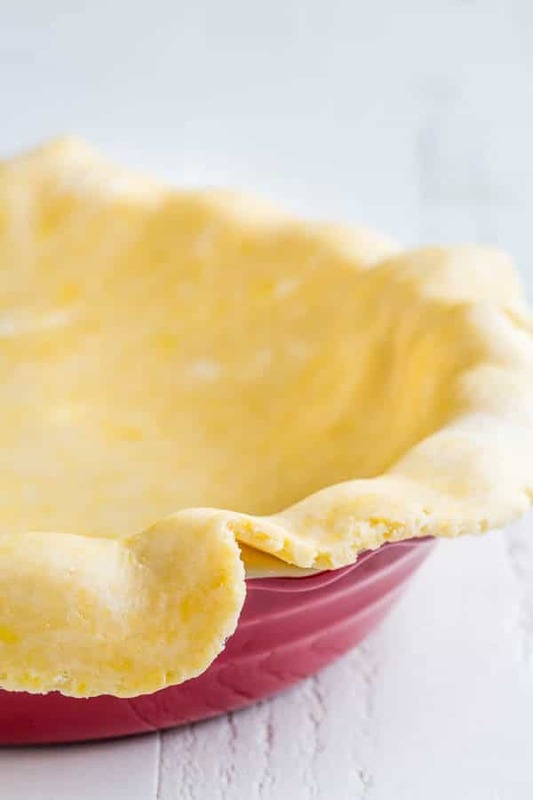 To blind bake a pie crust, roll the pie dough into 10 to 11-inch circle on a lightly floured surface. Wrap the dough around rolling pin and carefully transfer it onto baking pan. Fold the edges out and roll until it meets the pie pan. Crimp the edges any which way you like. Using a fork, pierce holes all over the crust to prevent bubbles and air pockets throughout the crust. Place the crust in the fridge for at least 30 minutes. Cover the crust with aluminum foil and pour pie weights, or raw beans. Bake for 15 minutes, and then carefully remove foil and pie weights. Bake for another 10-15 minutes, or until golden brown. This recipe can be easily doubled for double-crust pies. This recipe was originally published on January 6th, 2013.